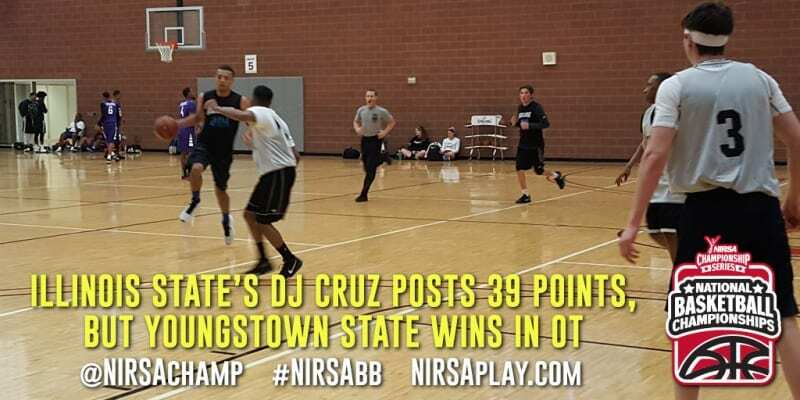 Illinois State’s DJ Cruz hit seven 3-pointers enroute to a tournament-high 39 points, but it was not enough as Youngstown State held off Illinois State 64-62 in overtime in the men’s intramural division pool play round. Cruz hit the game-tying shot in the final minute to send the game to the extra period. In OT with the game tied at 62, YSU’s Chibuike Obinnakwelu went to the line with 0.7 seconds left and drained both free throws for the 2-point win. Obinnakwelu had 16 points and 7 boards to lead the Penguins. Dakota Nagel added 8 points and grabbed 11 boards for the Cardinals. Trevor McQueeney scored 37 points and grabbed 9 boards as Northern Colorado downed 2015 IM national champion Georgia Tech 80-71. Patrick Lamar had 16 points for the Yellow Jackets. Lauren Cox’s free throw with 15 seconds remaining was the difference as Virginia edged Marquette 28-27 in women’s club pool play at 11:45 am today. Cox had 8 points to lead UVa, with Ashley Barnes and Cierra Hall adding 7 apiece. Bri Schnese and Anna Lansdowne each tallied 8 points for the Golden Eagles in the defeat. Also in women’s club play, Duke went on a 13-0 run in the game’s final two minutes to down Prairie View A&M 47-34. Tara Fan scored 7 of her 9 points during the run. Kelly Vittetoe posted 16 points to lead all scorers. Monique Abbs had 13 points including 4 three-pointers for PVAMU.